Hawk Macrae is an agent with the DIA. Macrae is the son of a Scottish father and an Apache mother. His father was an oil speculator but he was raised by his mother on a Chiricahua reservation in the southwest. From his father he got a fair share of tenacity and determination. From his mother he got his dashing good looks and a dark complexion that allows him to pass as any number of nationalities or races from Latino, Native American, Arabian, and even Italian. Hawk Macrae has two careers going at the same time. He is internationally known as a major star of Western movies and as such is able to travel to all parts of the world making a film, studying possible sites for one, or living as a jetsetter on vacation. He is extremely popular wherever he goes and gets star treatment on a routine basis. He is on a first name basis with the rich and powerful. As his other career, he is an covert operative for the DIA and has been such for several years. Trained in all forms of spycraft as well as how to stay alive in fights with fists, knives, or guns, he also knows enough to keep such fights to a minimum. He is well versed in parachuting, scuba-diving, car racing, and, as a Western star, riding just about any animal that can be ridden. When he is not acting in a movie or taking an assignment for the government, he likes to relax at his spacious Lazy-H ranch in Arizona. That is not very often, to his dismay, as the movies call to him as does the DIA. 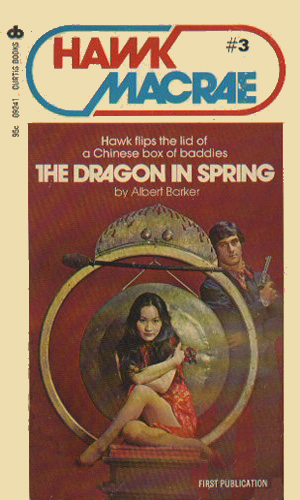 The author, Albert Barker, has two series in the collection but they might as well have been the same for all the similarities. While the two characters, Hawk Macrae and Reefe King, have totally different origins, they are both actors-turned-agents, they both use their movie careers as covers for their assignments, and they both have uncles who are key personnel in Interpol. While the following is just conjecture, it should be noted that the first series, about King, was written in the 1969-1970 period for Award. 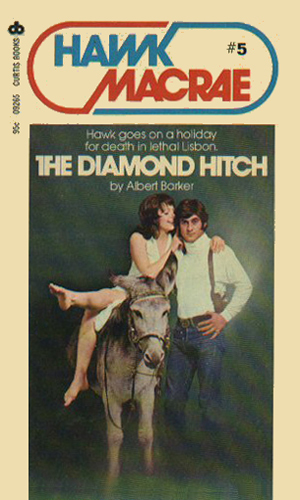 It seems that Mr. Barker then changed publishers to Curtis where he 'created' his new series about Macrae. 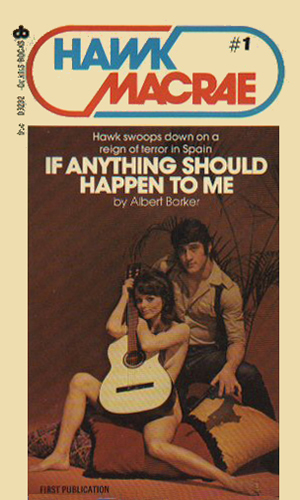 Shooting a movie in the south of Spain, Hawk Macrae is invited by an old friend, a widow of a dead President, to go yachting with her and some friends. En route, she is kidnapped and it is up to Hawk to bring her to safety. His agent wanted Hawk Macrae to travel to Europe for the USO. His uncle, head of Interpol's drug enforcement division, wanted Hawk to come to Europe to help investigate a new drug route. Together, they would get Hawk involved in a mess that would leave him an addict en route to being dead. Hawk Macrae's official reason for traveling to China was to help create a documentary to improve relations between nations. His unofficial reason was to make contact with a dissident group determined to overthrow the communist government. 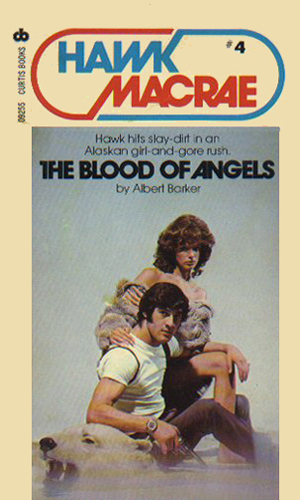 The job of staring in a movie about the rigours of life in Alaska as a bush pilot takes Hawk Macrae to that northernmost state and gets him involved in a conspiracy to cause civil disorder throughout the country via a group calling themselves the Angels. A trip to visit his Scottish ancestral home with his uncle takes a detour to Portugal where the elder man, working with Interpol, gets Hawk Macrae involved in a case to find the source for some excellent counterfeit American bills. This case, hardly a spy adventure at all, concerns the return of a body double of Hawk Macrae from prison for hijacking and moves into a case of stolen art treasures in the capital of Italy. Oddly, this is the name of a movie Hawk is making. It is also the name of a movie made by Hawk's alter ego, Reefe King. It may not sound like a compliment but I mean it as one when I say that if you are not looking for a great deal of depth in a good action adventure but you still want an enjoyable story, the Hawk Macrae series is a good choice. Of course, considering the comments made in the About section, you should start out with the Reefe King series beforehand. Macrae is, of course, too good to be true. He is too handsome, too glib, too suave, too much loved and respected by everyone. But who wouldn't want to be him? He had beautiful women, great fans, the best tables at restaurants, always a room in the hotel, never without a plane to take him places, and lots of people trying to kill him. Okay, I could give up that last one.